My unfortunate habit is hanging onto stuff longer than they’re actually needed. Sometimes, I feel justified in getting a second use out of some things. Mostly, though, things like scrap pieces of paper, clean enough paper towels, and empty containers liter my personal space. I don’t have this problem at work. Maybe because there the resources are essentially limitless? If so, I need to break that mental habit. My clutter starts when I’m too busy to organize things. Objects get thrown into an open space because I don’t have the time or energy to sort through them. 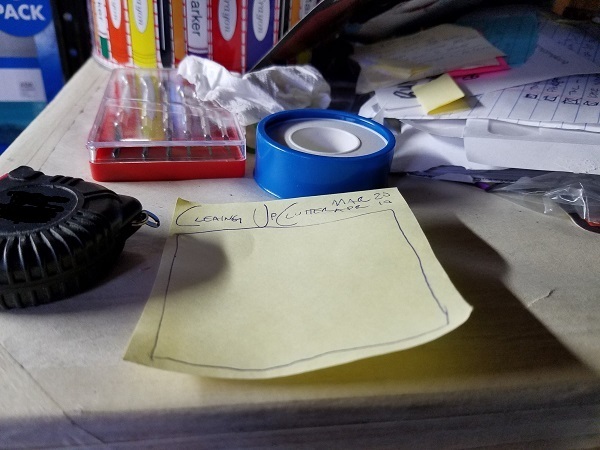 What ends up happening is that many things that could fit in well together are often separated, so my sufficiently large workbench can quickly fill into a disorganized mess with just a few scattered documents, tools, and other miscellany. My natural inclination, especially after cleaning for more than 30 minutes, is just moving clutter from one area to another. 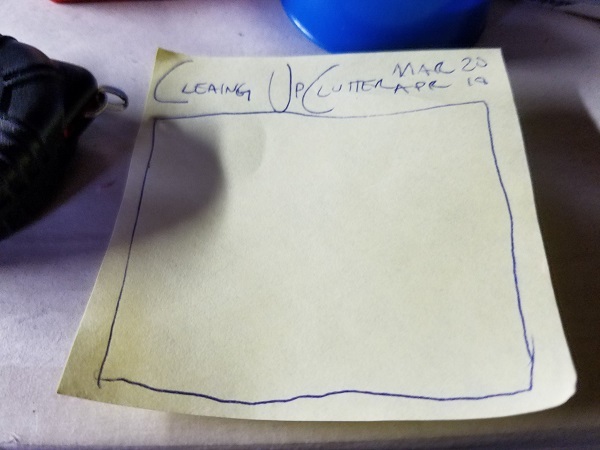 When I get to this point, I know I need to take a break, since I’m running out of steam to be critical about the clutter I’m cleaning. That’s why initially it’s psychologically difficult to clean on your own: those memories you formed with certain objects are mental roadblocks. Clutter can be difficult to tackle. That’s why I start by moving the smallest things first. Misplaced tools can go back to their proper areas, blank paper can usually group together well, then just like stretching before a workout, I’m well on my way. 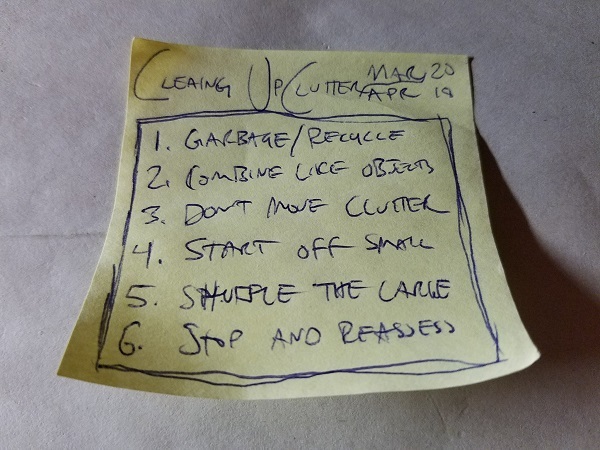 When I reach a mental/physical roadblock, get interrupted, or run out of steam, I’ll then return to sorting the clutter that’s easiest to move. After reaching a good point in my organizing, when I start to see some major progress, I tackle the clutter hidden in boxes. Maybe at one time there was an order to that box, now, only chaos. If I have plenty of space freed up, I might dump out the contents and reorganize them, although this can be dangerous since it even briefly reintroduces clutter into the environment. One hour per week of extensive decluttering (per area) works best for me. That gives me enough time to make a dent and prevents me from losing things. With my workbench now reclaimed, the final piece to preventing clutter from reaccumulating is solidifying the clutter-free zone mindset. I do that by assessing the former mess at length. The workbench now has a strict one project per use limit. 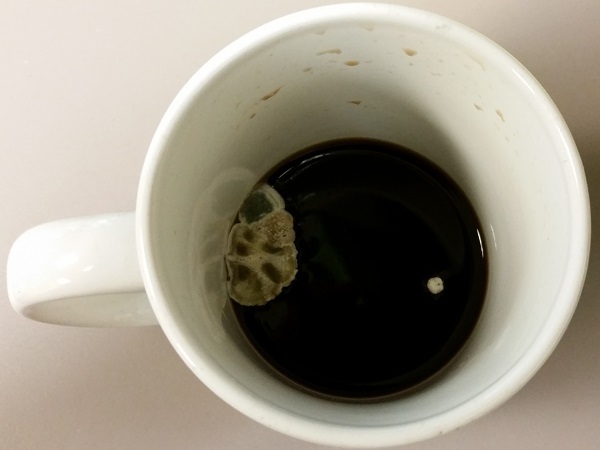 Photos: Taking notes while cleaning, with the last photo being the moldy coffee from the introductory sentence.